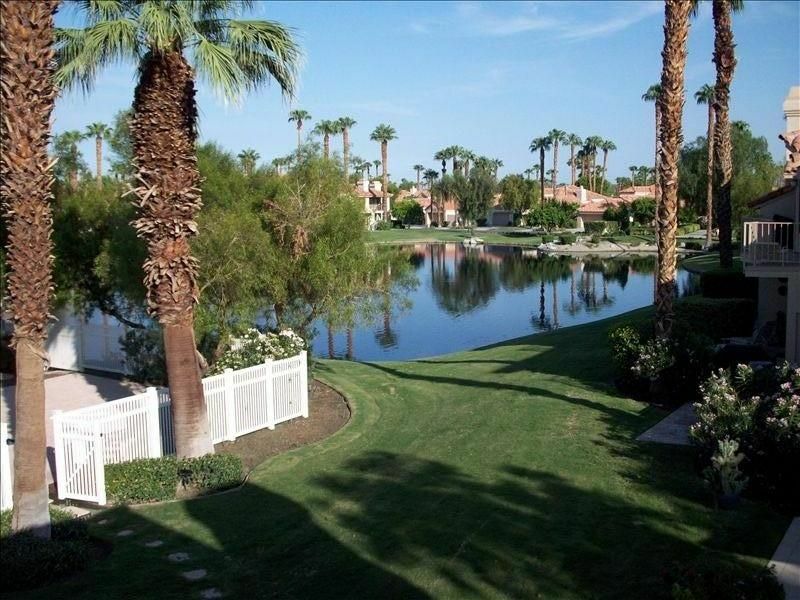 Waterfront Unit with Views of Lake, Waterfall, & Mountains! This wonderful upstairs condo has a two car garage just a few steps from the front door of your home away from home. The views from the living room are of two lakes, a waterfall and the almost exclusive pool & spa! The patio is covered so it will keep you cooler in the summer and dry in the winter. It's located in the Palmer course area, just a short distance to the Stadium Clubhouse, which is open to the public. If you are thinking of golf, call Stand-By Golf for a discounted, next day tee time at PGA West or 100 other courses that use this tee service. The home is laid out with the master bedroom overlooking the water views and the other bedrooms facing west. You have a Ralph's shopping center just two miles north on Jefferson St. Just two miles West of Jefferson and 52nd St., you will find the village of La Quinta with shopping, Ralph's stores and restaurants and more. Just west of Jefferson on 52nd St. you will find SILVER ROCK, the Cities two championship Palmer courses which are open to the public. A golfers paradise! Don't miss out on seeing the HUMANA (Formerly the Hope) CLASSIC in Mid January! Play will be on the Stadium Course in the PGA complex across Jefferson St.
Keywords: This 3 bedroom 2 bath condo has it all - overlooks the pool and spa, Lake and Waterfall. This condo will accommodate 6 people with 2 Queens, and two twins. My partner and I are avid golfers, and absolutely love the area. We want to share our home with others, because we are proud of it. We have tried to price it to be affordable for those who want to come to PGA West. If you like quiet nights, sparkling skies, rugged mountains, sheep, goats, and other wildlife, PGA West would be a great place for you to stay. Not on the course, but on a lake with a beautiful waterfall, you only have to walk across the street to be on the legendary Palmer Private Golf Course, and sometimes be able to watch Bighorn Sheep graze at the end of the day! And,make sure to bring your bikes or rollerblades, as the PGA West grounds are perfect for early morning or late trips! Our place is smack on two large lakes separated by a beautiful waterfall. Perfect place to unwind after Joshua tree, atv trips in salten city, golfing, and living desert! Everything was great, location and felt like home! Had a great time watching golf and enjoyed relaxing after a long day on the course watching the Pros! Excellent views, good condition, but could use some repair. Thanks Jim, glad you enjoyed your stay. We know we are a tiny bit outdated by today's standards, and we willingly reflect that in our price. But, I'm not aware of any repairs that have to be done. Please let me know what they are, and I will have them fixed within 24 hours. This condo was better than the pictures and a great comfy place to stay! The amenities were great. From floaties and towels for the pool to the fully furnished kitchen and laundry room, this condo was all we could have asked for. The two twin beds were a bit firm but I’m still thrilled to give 5 stars. Nice clean spot! Oh and very close to the pool! Taxes include sales tax and the local 10% occupancy tax.